Could Breeders and Shelters Work Together? Blog Home >> Sheep >> Could Breeders and Shelters Work Together? Thank you so much for all your insightful comments about overpopulated shelters and whether responsible breeders could help reduce the number of dogs who enter shelters in the first place. Here are a few, admittedly somewhat random, thoughts about the issue. Two: Influence breed clubs to add behavioral stability to a criteria in shows. It is indeed true, as some of the comments have mentioned, that many clubs in Europe require animals to be carefully screened by vets, and are given behavioral and soundness tests before they can be registered. I visited a Warmblood stud farm in the Netherlands once, and was told that the club had decided only 12 studs could be registered that year, and the farm’s drop-dead gorgeous and bomb-proof stallion had been rated “number 13.” No foals for him, at least not that year. Wow. That would never fly over here in the land of the free, but at least we could start advocating that breed clubs add more to a championship than conforming to a structural standard and having a perfect gait. I know many competitors argue that just being in a dog show is proof enough of a dog’s disposition (me own mum used to make this argument to me), but you know . . . it’s not. Three: Legislation? I don’t know. I am torn about this myself. On the one hand I agree with the argument that the ‘commercial’ facilities will be the least affected by this. Right now in Wisconsin we finally got a “Puppy Mill bill” passed, but the language says that breeders must adhere to standards that “are to be determined.” Last I heard the make up of the committee deciding on the standards had no behaviorist, no trainers, and lots of you guessed it, large scale breeders. (I’ll find out more about this in the weeks to come….it’s on my “To Do” list when I catch my breath from UW.) On the other hand, perhaps licensing will really will have the effect of 1) improving large scale breeders and 2) educating the public about what they should, at a minimum, expect. Four: Helping breeders and rescue groups to be realistic: There were several comments from people who felt that some breeders or groups set their standards for a new home unrealistically high. I have heard this complaint from quite a few people, including a dear friend and veterinarian with a long history of taking in special needs dogs and going to the mat for them. She finally gave up after waiting for 6 months to adopt an older, needy dog from the same group who had adopted her her first dog. She went so far beyond the call of duty with this dog that she deserved to be sainted, and yet the rescue club couldn’t decide if she was worthy of another one. How do we help breeders and groups be more realistic about good homes? Oh dear, I don’t know, but I do think we need to collectively work on it. I might have a better idea of how to solve these problems if I wasn’t so damned hung over. Last night I had a total of one and a half glasses of red wine and I was a happy girl. Not so happy this morning though. It took me a few hours to figure out why I felt so crummy, and when I did, I actually ran into Andrea’s office and said “Oh good grief! Maybe I feel so crappy ‘cuz I’m hung over! Do you think?”). I guess it is clear that this is not a common occurrence in my life. Meanwhile, back on the farm: Willie is much better about the bedroom, but we’re not done yet. I did figure out that it’s all about the bedside table. If I even turn toward it to take a sip of water he’ll get up and slip out of the room. I am guessing it’s about the drawer, the one I open to get my reading glasses. It has a low, growly sound when it is being opened. But he’s better: a few nights ago he never left the room at all, (and then regressed the next night), and he now comes back in soon after I turn out the light (also on the bedside table.) One step at a time. I have to confess I have done no counter-conditioning, no DAP (which, fyi, I have found to be useful in some cases). This is out of pure laziness and nothing else. By the time I walk up the stairs at night I consider washing my face and brushing my teeth a significant effort. It’s been gorgeous, just plain and simply gorgeous. The warmth we are experiencing is 2-3 weeks early, and a big worry to those of us who worry about the plants and the environment. It is also just a tad unsettling to see things happening when we don’t expect them, but the tulips and many of the trees are now in bloom. Here’s Willie lying in front of Tulip’s grave site, where she used to stand and broadcast her presence to the coyotes across the road. And here’s a fuzzy photo of the bottle lambs. 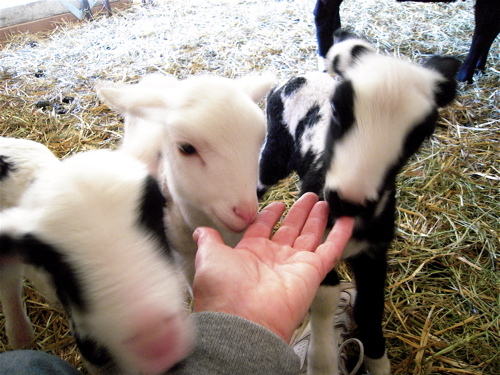 Granted the only thing in focus is my chubby little hand, but I included it because what you see is pretty much what I usually see: a black and white milk shake of lambs jockeying for position. « “Responsible Breeding” an Oxymoron? There were so many interesting ideas on solving the breeding/rescue problem, and as usual, they were so well summarized and enriched in the next post. I particularly liked the idea mentioned by Gunilla, that banning the sale of puppies (and kittens?) from pet stores would greatly reduce the numbers of dogs who are purchased impulsively, likely to have originated in a puppy mill, and seemingly at high risk for eventual surrender to a shelter. I never liked the idea of pet stores selling puppies and kittens, but now that I give it serious consideration, it seems like an absolutely ludicrous practice. It also seems to me that abolition of this practice would virtually put an end to the puppy mill industry, although it might not have much of an impact on the small-scale backyard breeder (of the ‘oops’/negligent variety). Here in Chicago, the city council is considering passage of a spay/neuter requirement for all pets and a $50 breeders license for anyone who doesn’t spay/neuter their pet, but I’m not sure this legislation would have much of an impact. It seems likely that this requirement would be hard to enforce and that people who are concerned about pet overpopulation are already spaying/neutering their pets. On the upside, we have a few excellent no-kill shelter organizations, at least one of which also offers free or low-cost spaying/neutering to low-income families. Improving access to low-cost spay/neuter programs also seems like a good way to prevent unwanted litters in impoverished areas. Joanna at Ruffly Speaking has a good post about point four (Breeder Etiquette), in which she argues that many breeders set people up to fail by expecting them to know the approved answers to dog questions. I think she’s really, absolutely right that you’re better off sending a dog to a home where the people don’t know a lot to begin with, but are willing to read all the books and learn as they go and generally love and attend to their dog, than to a home where people know all the right answers but aren’t willing to adapt as they go. I think this is particularly important because sometimes the focus on dog breeds obscures the extent to which individuals are just themselves – especially important with some of the larger and less homogeneous breeds like labs, where you get a spectrum all the way from really smart, high energy, intensely prey motivated working dogs to sweet, completely relaxed couch muffins. Now, those things often run in lines, and it’s worth knowing the breed so you can stack the odds in your favor (and that’s something a good breeder can help you with that a shelter can’t), but people adopting a shelter dog especially need to focus on the behavior of the individual dog they’re getting. So someone who can give good answers about a breed and why they want that specific breed may not be the best fit for a particular individual within that breed. As far as legislation goes: from my experience working on and reading about animal welfare legislation for other animals, I think we’re a lot more likely to get successful legislation that outlaws really terrible treatment – wire-floored cages, etc – rather than legislation that only allows actually responsible breeding. (Chances of getting effective legislation for that second one are absolutely nil.) The AKC, on the other hand, could be a real enforcer if they wanted to, just by withholding full papers for dogs with major, definitely genetic faults. That would make AKC registration both harder to get and a more valuable signal to customers, though it still wouldn’t rule out bad treatment for puppies. Here’s one other thing: it would really help to have better resources for actually finding responsible breeders. There could be a certification process, which would probably provide a fairly basic floor – there are several for meat, of which AWI is the best one I know. The problem with this is that it’s expensive for breeders to go through certification processes like this, and small-scale highly responsible breeders probably aren’t making much money anyway, so it would need a substantial subsidy to get off the ground at all. Neither legislation nor certification is likely to do a single thing to improve puppy well-being at the top end of the breeder pool, but I bet legislation could help at the bottom, and certification could help at the middle. I was at an AKC sanctioned Golden Retriever dog show and an AKC rep happened to be standing near me talking to the show’s organizer (I’m sorry – I don’t show so don’t really know all the proper terms). They were discussing the issue of AKC shows allowing mixed breeds to compete in agility and other non-conformation type events. Imagine my surprise when this AKC representative expressed the opinion that mixed breeds should not be allowed to compete, in fact, mixed breeds shouldn’t even be allowed to live – especially any dog in a shelter. Shelter dogs obviously have psychological issues or they wouldn’t have landed in the shelter in the first place and so they should all just be euthanized. As the owner of a number of golden retriever rescues, who had landed in shelters, I was unable to contain myself. We had a frank discussion about his opinion, none of which changed his opinion I’m sure. All of this to say I am not surprised that breeders, breed clubs, shelters and rescues don’t find it easy to work together. With an attitude like this coming from the top, how could they? Each of these recent posts have really gotten me thinking. Thanks. Much of the discussion so far has been about influencing the “gatekeepers.” What can we do to take these discussions to a wider audience? Most of us were probably not raised to have the level of consciousness and care toward our animals that we’ve developed over time. I keep trying to think of the influences in my life that increased my awareness of bonding with my dogs. For me, books were really important. From The Other End of the Leash (dogs don’t pull when they’re off leash) to Suzanne Clothier’s Bones Would Rain From the Sky (why doesn’t your dog see you as the source of all good things? ), I remember ideas that caused me to pause and think about my relationships with my dogs in a whole new way. Probably the other big influence came from dog behaviorists and trainers. Getting help from experienced professionals taught me what I needed to teach my dogs. And how much more I have to learn. But many of the folks we’d like to see learn the lessons we’ve been talking about in these posts and comments won’t visit a breed club website, or attend a dog training class, or even visit this website. They just know they want a puppy or dog that will be a good companion and friend, don’t necessarily know how to find that good friend, and don’t know how to build that friendship over time. I guess what I’m wondering is if a grassroots movement of “doggie ambassadors” would be key. In addition to you, Patricia, advocating for dogs as part of your profession, I’m sure many of your readers are doing their part as well. How do we teach the people around us each day about making responsible pet choices? And, just as importantly, how do we do it with as much kindness as we would offer to our animal companions? So maybe a related post (or article in The Bark) could talk about how people who love dogs and want the best for them can create a culture where adopting the right dog, training it, caring for it, and keeping it for life is the norm. The lambs make me go squee! I have five American cocker spaniels – all of whom came to me through rescue (I volunteer with Dallas-Fort Worth Cocker Spaniel Rescue). My dogs are the spectrum of what I see as the problems with dogs in the US today. MacGregor – 8 years old. MacGregor has seborrhic dermatitis. His eyes are beginning to fog over with cataracts. He also has a healed skull fracture from a previous owner, epilepsy (probably from brain damage) and he has had to have both ACLs surgically repaired. I also believe he was abused as a result of standing between a man and a woman, based on the way he reacts to my husband and I hugging, even after almost four years with me. MacGregor has a tremendous amount of anxiety, which is why I read your updates about Willie avidly. Scruffy – probably five years old. Has optic neuritis and hyperkeratosis, probably as a result of surviving distemper. Scruffy has some residual vision but is essentially blind. Ironically, he is the closest to breed standard cocker I have and is absolutely gorgeous. His temperament is good, although you have to be very aware of his blindness while dealing with him. Shawna – probably five years old. Shawna is very small and was probably bred for size. She has juvenille onset cataracts and glaucoma and is essentially blind. She is a bit of a loner, but has a good temperament. When she’s had enough, though, she’s had enough, and she leaves. Kaydee – eight years old. A “silver buff” cocker, definitely a sport. Kaydee belonged to a child who died of cancer and her care was neglected for a long time (which I don’t at all criticize the child’s grandmother for – she was trying to contend with her grandson dying and everything else). Consequently, Kaydee has chronic ear infections we deal with regularly and is partially deaf. Redford – probably 14. An older gentleman who was dumped a shelter for committing the crime of getting old. Redford has a heart murmur and an arrythmia, colitis, arthritis and some senility. He’s a permanent foster for me, and he will live here until his time comes. When I look at these dogs I see infractions on all sides – the breeders who brought them into this world obviously didn’t take care to ensure they were not breeding congenital problems. Sometimes life got in the way of the original owners, and sometimes they were just horrible people. All of them had to be trained and socialized. We also had to make allowances for them – poor MacGregor still can’t stand it when you cross your arms and look at him, and Redford has to have a clear beeline for the front door at times. Diagnosis from this amateur dog person and general all around thinker? A general overhaul of the way we treat animals is required, and I’m not sure that’s a universally doable thing. I want people to stop cranking out animals for a quick buck, I want corporate America to stop selling animals in retail situations, I want training to be universally available and affordable, I want animals to get their vaccinations and be spayed and neutered, I want pet owners to understand that their pets are individuals who do have a limited understanding of what’s going on around them – enough to where the owners’ actions can do serious damage. I also want dog owners to pick up behind their dogs, but that one may be the most unattainable of the bunch. I absolutely think breeders and shelters can work together. One of the biggest practical components of creating a no-kill community is building foster networks – responsible breeders and breed rescue groups are already doing that. And the expertise and love of their breeds that responsible breeders can bring to the no-kill movement can help overcome two big obstacles: puppy mills and prejudices against “pit bulls”. “There are over 53 million dogs in the U.S., about two-thirds come from backyard breeders.” If true, that’s staggering. I’m still a fan of licensing breeders to not only give the public the knowledge of what to look for in a breeder (or at least some minimal requirements) but also to allow some authority to regulate. The former could probably be started by private organizations, though I think that’s definitely an uphill battle. I have big doubts that backyard breeders will care much about “responsible” breeding. Relentless campaigns to promote shelter adoptions would probably help, but a lot of people want (or think they want) puppies or kittens, and those go pretty fast at shelters. I’m pretty sure I could get a $100 puppy if I call that sign for the Yorkies I keep seeing…sure his eyes might not be centered on his head. He may walk with a limp and bite at the air, but its still a puppy. I would definitely like some way to see training become more affordable. As someone with a problem dog, I know it can get expensive. It’s even more expensive if the training your getting is not particular effective. I’m about to go on the hunt for a new trainer and I’m prepared to pay for it, but I suffer any loss of income…I won’t be able to afford it. I have had many people tell me they’re looking for a particular breed, and wanting to know how to identify a responsible breeder. It’s not something the general public knows. And I think the best way to educate people is not to preach at them, but to show them how to make the right choices, as Pamela said. I try to make my blog posts funny and entertaining and still throw in some education at times. I don’t think anyone wants to go to a blog and read about how they should spay and neuter, or how many dogs are dying every day, but if they can read funny stories about pets (or see cute pictures of lambs! ), and learn a few things in the process, I hope that is helping to make a difference. Of course the down side is I’m probably convincing people they never ever want to foster a homeless pet, so there’s that. Overall I hope to do more good than harm. I think if more people will be understanding of others and show compassion to people as well as animals, we can educate people who can educate more people and so on. You have a huge audience and it’s great to see that you are willing to tackle these tough subjects and educate people in a way that is interesting and thought provoking, but not preachy or mean. Great job, and thank you! And thanks for the lamb pictures too – sooooo cute!! I’m with Pamela on the ambassador idea and think educating owners and potential owners is key. …and skip to page 2 if you want to go directly to the part about the Swedish Kennel Club. These two posts have had me checking back for the comments multiple times a day. I have vacillated between anger, sadness, amazement and some exasperation. Do I think that breeders/trainers/shelters/rescues can work together? I’m sure they can, but the problem(s) are complex and I’m not sure it .will. happen. Too much depends on all of the people involved. For my own experience, I volunteered at a shelter to work with the dogs and workers. This shelter called me for advice repeatedly and then ignored what I said. This does nothing to make me want to work with them. I never heard that they didn’t understand, or that they had questions. There was no discussion….they just called then did their own thing. I explained and showed them how 5 minutes a day could help to boost their adoption rates. I was told the workers/volunteers don’t have time for that. I was told their adoption rate was fine. But they continued to call. It was like ramming over and over into a brick wall. This may not be the norm for shelters, but it *is* my personal experience and completely turned me off of helping them. Here is what I have done on my own. I have offered .very. minimal fees for training. I have done follow ups on dogs that I have taken in and trained, for years after they were adopted at no charge. I even went to court for one dog. I have done free follow ups for people who have gotten a new dog/puppy that have patronized my classes, especially those who are retired or on a limited income. I have taken my own dogs out and allowed potential clients to handle them before they have signed up for classes to see if this is what they wanted. I .still. take my dogs out to public stores and venues so that they have the opportunity to become good breed ambassadors and good ambassadors for positive training. I very often have people come up to talk to me after watching my dogs out in public. I always leave time for them to speak to me if they want. What *I* would like to see is neighborhood or small communities that hold regular CGC testing and have some sort of reward for that. I’d like to see more one or two day handling classes, ie: nail trimming, tick removal, how to have dogs greet each other. I’d like to see more short, inexpensive, classes to teach recalls and sit for greeting. I’d like to see more community involvement to help reduce the burden on shelters. It would be far easier for small groups of people to monitor and help those who are having issues than to pass ordinances that won’t be enforceable or alienate pet owners. I’d like to see more landlords offer pet friendly places to live, and I’d like to see them reward those who have proved the dogs are well mannered and good citizens. It’s completely, COMPLETELY wrong to breed a Pyr Shep who doesn’t destroy the house if they don’t get hours of exercise. It’s totally wrong to breed a Maremma who tolerates other dogs coming in the yard. It’s appalling to consider a small terrier who doesn’t bite anything that moves fast enough. It is not correct for every breed to be some variation on a Golden or a Cavalier – incredibly happy, constantly tolerant, forgiving to the extreme. There are a bunch of breeds that are not SUPPOSED to be able to thrive with the kind of idiot ownership that creates the behavior problems that get dumped at shelters. Them passing some kind of innate “I tolerate anything” test would be a sign that the breed was going completely down the tubes, not the opposite. Second: Exactly what is being measured and by whom? There are a bunch of US registries that DO insist on a temperament/working evaluation, and they have ended up in vicious arguments and splintering into multiple clubs to the point that it’s a real problem because it isolates very small populations of already low-number dogs. The flashpoint for all the splits always seems to be the working test – is my dog supposed to kill a cat if it crosses its path while hunting? (Wirehaired pointers) Is my dog supposed to show willingness to attack a stranger it deems menacing? And so on. And, of course, dogs who pass those working evaluations are not automatically easy to live with! The third huge problem, of course, is that it’s useless to be putting one more layer of crap on good breeders who are already keeping dogs out of shelters. How will adding a mandatory temperament test to a championship change an already responsible situation? Laurel, the idea of a registry actually popped into my brain while waiting for the train tonight! Much like Realtors(R), the registry could have an openly-publicized code of ethics and a database for those looking for a particular breed. There would need to be fees and governance to ensure that the registered breeders were adhering to the code and funds for publicity, along with a mechanism for folks to report observed violations. I think responsible breeders and breed rescues have enough common ground to work together. Both are strong proponents of health standards (rescues getting the fallout from lack thereof) and taking responsibility for all members of their breed. Breeders could refer those looking for pets (versus working and show dogs) to breed rescues when they have none to offer. Cooperation here could be a wonderful thing. As a vet, one of the most frustrating things I come across is new puppy owners that have just paid $1200 at the pet store for a new puppy (usually a yorkie or other tiny thing), and now have no money for vet expenses or training. I think a lot of people just dont see the the value in non-tangible things. Perhaps a way to help all involved is to have breeders working with trainers to prepay for puppy classes for the new owners. Finding, signing up for, and paying for a class is the biggest impediment for most folks. If the cost of a basic obedience class was added to the price of the dog, maybe it would be easier. Vets need to be involved as well. We are the first place that a new owner often stops with their puppy. Even those that don’t have a lot of training experience can locate good trainers in the area and emphasize the need for basic training. I tell all my new puppy owners that while vaccination and sterilization is important, the think that kills most dogs is behavior issues. I give them a brief talk about house training and socialization and tell them to call me with any questions. I help them if I can or refer them if needed. I always put the local trainers and books I like on their reciept so it’s handy and available. Perhaps progressive training groups will be the meeting ground for the sorts of shelter and rescue personel and breeders that would be good at team work. Maybe the people that can understand the patience, calm headedness and creativity of training are also the sorts of folks that can start a conversation about how to come together to work out a solution. When I go to seminars on training or behavior I see the same people there that I see volunteering with the local shelters and rescue groups, I think its a hopeful sign. Trisia, thanks for admitting to “Human,” foibles like being so tired you can’t think about doing Counter Conditioning or other training with Willie at bedtime. That’s the “Human,” in the title of this blog… And — who of us readers can’t relate? How about, to address one very small part of this enormous issue, reciprocity between breed/other rescue organizations that maintain similar standards for adoption? When searching for a rescue dog to adopt, I was approved as a potential adopter by one area group. I happened to see that another group operates in the general geographic area, and it had very similar requirements. I suggested to both groups that they might develop a network and exchange their lists of approved, interviewed potential adopters. Never had a reply, and I’m certain they are very busy and depend on volunteers. Still, it seems a mutually beneficial option. Maybe such reciprocity could extend to shelters as well. Folks who “passed” the home interview/inspection would still need to meet the dog with someone to assess the fit of the match. Very interesting posts and comments on this subject. I can’t think of anything new to add but have been avidly reading all the new comments. Trisha, your hangover story cracked me up! And I, as a fellow lightweight and only occasional drinker, can relate. I’m glad that Will is making progress in his fears of the bedroom. Can you point me in the direction of resources to help Bear with fear in the car? He seems to get anxious when we go over bumps and such, the noise makes him nervous. It’s not severe at this point, he will take treats still, but sometimes he paces in the backseat and tries to get up front. He is also much calmer when either my husband or I can sit next to him in the back. But that is not always an option, and I don’t want his fear to progress. Thank you for any info you can provide or book suggestions you can make. The biggest obstacles to overcome are the anti-breeding mindset of rescuers (“don’t breed or buy when shelter animals die”) and the “don’t tell me what to do with my animals or you’re a tool of the AR activists who want to eliminate pets” mindset of breeders. These are so deeply embedded in the respective cultures that I fear there is no solution. I think the only way is to start with the more forward thinking shelter/rescuers and a few willing breed clubs to build models that work. I think Cassie’s suggestion that progressive training groups may provide the meeting ground between breeders, rescues and owners is an extremely interesting one. I have attended several puppy and intermediate classes locally, and have been impressed by the helpful, non-judgemental approach most trainers now take (we will forget the experience at an old fashioned “yank and tug” class!). Could refunding the fees for an appropriate puppy class become the benchmark for a good breeder, and for a good rescue organisation, along with providing advice and support throughout the dogs life, and beyond? @Frances and Cassie, most rescues and at least some breeders refund a certain amount with proof of obedience class. My rescue refunded $50, a bit less than half the cost of the class, for puppy kindergarten/basic dog 1; the breeder linked to above also refunds money open completion of puppy kindergarten. It’s a great thing to do and I agree that it should be standard, but it’s not a new idea. I want to say a word in defense of the non-profits people have mentioned that have rejected or ignored suggestions. There are genuine systemic issues among not for profit agencies. I worked for non-profits for years, and the places I worked were always running flat out just to maintain programs and raise enough money to keep their doors open. This led to some poor strategic decision-making because they were unable to spend money upfront to get long-term savings. At the same time, pretty much everyone who’s ever worked for a non-profit or in another context where you get a lot of suggestions about how to do your job (being a teacher is amazing/terrible for this) can probably tell you that things that sound like they should take 5 minutes don’t; that many, many of the suggestions we get are things that have been tried before or are impractical for institutional or environmental reasons that really truly can’t change; that the obstacles to doing something new are often substantial, even when the new thing is unambiguously good; and that responding to every suggestion in detail will more than fill up the time they have available for work. This goes double for organizations which run on volunteers, like most rescues. So please, forgive the people who didn’t write back to you about your (doubtless good) plan for them to do something different. @Pamela & all – There is a sort of grassroots type movement that Sue Sternberg started from Rondout Valley Kennels, it’s called Training Wheels. (you can get more info on line http://www.suesternberg.com) It involves bringing the shelter support out into the public by providing free dog training (one on one), proper management equipment, food, toys, etc. We simply work in our neighborhoods and scope out owners with dogs who we think can use a little coaching and offer to help them with some basic skills so that they can build a better relationship with there dog. It’s not always easy, because it involves a great deal of tact, but it’s a very rewarding volunteer position. I also like the idea of holding a deposit and then refunding it if someone provides proof that they went to a recognized training class. Great idea! @ Laurel- I don’t think that a refund is enough. I believe there is a vital and powerful difference in a refund for classes completed versus just having that service already paid for. I think it matters for two reasons. For one thing, I want to know where that person is going. It would break my heart to basically pay for the puppy class that included a nice new shock collar or choke chain when there is such a great chance to introduce the new pet’s owner to the wonders of communication that you learn in a great training class. The other thing is that I want the owner to feel like they are getting a great deal and have a good emotional connection to the training class already. If they have a coupon in hand for that puppy class, they will feel like it’s something extra. They didn’t have to be worried about finding the right trainer, they will feel confident about it. And it hurts to give away money- no matter if you are going to get a refund it’s a deterrent to spend another $120 when you just spent some hundreds of dollars on the dog. I’m sure I’m not the first to think of this, but I don’t see it in action anywhere in my area. I am going to try and get something like this set up with my nearby shelter with an introductory class for free. I would rather have someone with a training business in the area get to do it, but if I can’t find a good match for that I may have to do it myself. I think it would really be win win for the shelter (less returns) the new owners (something free and informative) the trainers (new clients- great advertising!) and of course the dogs. I live in a metro area with really stellar animal shelters – they combine mobile adoption and other outreach events to get pets exposure to potential adopters, occasional free rabies vax clinics, humane education for kids and reasonably priced ($100 for four one hour sessions in small classes). I signed my dog and I up for one of their classes a year or so ago and one thing I noticed in the class was that they had good suggestions about ways to play with your dog – and not, “your dog will eat you alive if you don’t play tug of war the right way” but more, “and another fun game is this”. (I really like the McConnell oevre for this interest in play, too.) I think that positive reinforcement classes probably flow naturally into these kinds of discussions and I think they’re really helpful for lots of owners – I think not everyone intuitively finds fun ways to play with their dog and an important part of classes is not just changing behavior, but working on the dog owner bond. All of which is to say that I think accessible, affordable classes are hugely important thing and that extending them to address things that help build the owner dog relationship is really useful, too. A second very helpful thing that rescues do and that more extensive infrastructure would help is transport of dogs from rural and/or overcrowded shelters to areas where they have a better chance of adoption. They currently do it on a fairly ad hoc basis, driven, literally, by volunteer chains of drivers. A more effective and consistent network for moving dogs to areas where they have a better chance of finding a home would really help. When I told my vet that I’d gotten my dog from a rescue group who’d gotten him from a rural West Virginia shelter he wearily sighed and said, “all dogs come from West Virginia.” But, moving them to a better resourced urban area really has found homes for lots and lots of them. And, in the same vein, I think both breed rescues and classes, events, and other socialization opportunities are important ways that breed fanciers can be involved in the wider effort to find homes and build happy homes for pets that need them. To Laurel re the volunteer groups’ overextension. Emphatically agree. What might work would be a new entity to coordinate/enable inter-group networking–reviewing adopter application requirements, policies, maybe establishing a model taken from the best for all groups to approve. (I’d hope groups wouldn’t be turf defenders, since they’re all working for the same ultimate goal.) Perhaps this entity could be funded by a grant to a responsible established shelter that already has cooperative contacts w/rescue groups; who knows how quickly a successful model could spread? It would need someone with a passion for the result–better placement for dogs–and the ability to organize. Wow, there are so many wonderful comments being made in this discussion that I was finally convinced to stop lurking and add my own thoughts. I totally agree with Joanna about the idea of universal temperment testing. As a owner of both Goldens (previous) and Rottweilers(currently) I think it would be a great disservice to these dogs to try to make them something they are not. How about moving more toward the European views, as previously mentioned by other posters, where the dogs are tested for breeding suitability by standards for that breed. I think for this to work in the US the AKC would have to get involved, because there are already breed groups that do this kind of testing, but obviously this does not make a difference in the eyes of the AKC for registration purposes. Finally, I am all for the ideas involving training for helping dogs stay in homes in the first place. As a trainer I talk to people everyday who tell me if this (fill in blank) doesn’t stop we are going to have to get rid of this dog. For example I talked to a lady the other day whos 8-year old previously potty-trained dog has started urinating in the house. This had been going on for about a week and she was already thinking about taking this poor dog that she has had for EIGHT years to the shelter. And when my first suggestion was to take her dog to the vet and make sure there was no medical reason for this ie:UTI she was shocked that the solution could be so obvious. This is the kind of thinking that we are all fighting against and its very sad. I think many of us know that the reason of “we are moving” or “we can’t afford her anymore” is often code for “we can’t handle her!” I actually own one of these dogs myself!! The code was “my apartment doesn’t allow dogs.” And I love the ideas of making training more obtainable for adopters and puppy buyers. My local shelter already offers free classes included with adoption for many dogs but only their training classes. What about partnering with other local training centers to offer discounts and coupons so adopters can pick the most convenient location for them? Sorry to ramble on!! Love the discussion!! Trisha, love the lambs, sorry to hear about the hangover!! And thanks for such a fantastic blog!! Your opening statement, you wish to see more collaborative efforts between good breeders, shelters and rescues, is a nice-to-have and I think it exists in many places, but from where I sit is not the lionshare of the issue. The major problems are the unscrupulous breeders. I live close to a couple of disasterous towns where Pit Bulls are bred and sold for drug money, to use in dogfighting and other unspeakable things. These dogs consistute a large majority of the shelter populations and are the first to be euthanized. Most of them are sold at 4 weeks and either receive no training at all or the wrong training (both a recipe for catastrophe). Shelters responsible for these towns have tried to control this problem through outreach into schools and other means but it’s a cultural thing which is so difficult to change. And then there’s the puppy mill issue here in PA. Yes, we passed some legislation to help but the laws don’t apply to the smaller breeders. The Amish and Mennonite breeders will distribute the “breeding stock” among family members in various locales in order to remain under the wire and can continue to produce puppies to sell on their farms, to pet stores and on the Internet through middlemen. This too is a cultural problem – the farmers consider dogs to be just another animal to use to make money. Our shelters work with some of these breeders to allow them to turn over their breeding stock when they are through with them instead of killing them, but not all millers want to risk being discovered. So, education, legislation and access to low-cost training are not the answers for these issues. For elimination of puppy mills, it needs to be truly grassroots to educate the public not to buy from certain places. But the Pit Bull issues are another story. And it seems to be getting worse. Finally, I’m with you on the hangover! I had one gin and tonic last night which caused me to awaken in the middle of the night. Now I’ll be groggy for the rest of the day. Gee, I hope I was lucid in this post! @Cassie: I actually disagree: I think a refund system, with an extensive list of good recommendations, is much better. Here’s why. The rescue where I got my dog is about a 45-minute drive from my house. If they’d bought me a class, they would very reasonably have picked a class near their location; that would have been basically impossible for me to get to weekly, and kind of silly since there are excellent classes within 5-10 minutes of my house. Breeders are in an even worse situation this way: they often sell to people who live several hours or more away by car. It’s unreasonable to expect breeders to research and know a good training program anywhere a puppy might go; even for shelters that adopt within a metro area, it’s nearly impossible to find a location and a time that works for that specific individual’s schedule and transportation constraints every time they adopt an animal to someone. So either breeders and shelters will do an insane amount of legwork that owners are perfectly capable of doing much more easily, or a lot of classes will go unused. The refund system opens up the possibility of owners going to bad classes, but you have to assume that owners are decent well-meaning people: if you can’t assume that, why ever let that person have an animal? With a well-meaning person, a shelter or breeder can say “this is what to look for in a trainer and a class, and here are some that are reliably good; these are some red flags that should make you run the other way” and the person will listen. @Holly: That sounds incredibly frustrating. I would love to think it was as easy to just tell people what to look for, but I think it often doesn’t work. At least in my area there are several trainers that advertise their “positive training techniques”, but when I arrive at the class I find that positive means to pat them on the head between corrective jerks on the leash. I refer most new puppy owners to a trainer 25 minutes away if they need more than just a basic petsmart class. There are tons of local trainers, but I’ve yet to meet one that doesn’t yank choke chains or use electronic collars. I know that when I was a well meaning beginner I couldn’t find the right kind of training on my own. But I’m in Texas, maybe it’s easier to find more progressive trainers when you aren’t in the south. And I’m not a breeder, but I do take in fosters. Two of the last fosters I adopted out were to non-local folks. It took me about 15 minutes to google trainers in their area and read their websites or send off an email asking about training techniques so I could give the new owners training recommendations. If i had just spent all of my time and heart raising a litter of pups I would be happy to do the same thing 5 or 10 times over to make sure all of those pups ended up with owners that new how to communicate with them effectively and humanely. Perhaps the shelter could have more than one trainer that offers free introductory classes. Perhaps a volunteer spends a day researching local trainers in a metroplex and making a list of preferred trainers. And I know shelters and rescue groups are burnt out and overlooked- I’ve been on the board of a rescue group and worked in many shelters. I still think this fits the “doable” and is easier than a refund. Our local shelter can’t afford to spend more money on the dogs and already has a lot of people turn them down because they think the adoption fee is too high ($120 for spay/neuter, vax, microchip, 1st month flea and HW prevention. $60 if they were already fixed when found). Not to mention the man hours to process the refund paperwork. I think this is a neat way to do something free without adding a lot of extra work. Patricia, loved reading your thoughts on these issues. I can’t tell you how many times I hear training clients tell me they went to two or three “responsible” breeders and were turned off because they were asked many questions. I in no way fault breeders for asking many questions and wanting to make sure their pups go to the best homes, however, what often happens is that these folk go to a pet shop instead. Complex issues, no easy answers. Unfortunately outlawing the sale of puppies in pet stores will not eradicate the puppy mills. The USDA only regulates commercial dog breeders who sell their dogs to a secondary market. Currently the only ways mills are regulated if they sell direct to the public is if the state in which the business operates has laws to regulate them. And most governmental agencies just don’t have the resources to ensure that these businesses comply with the law. Increasingly puppys mills are doing direct sales to the public – either by selling from their property, or shipping puppies to buyers who purchase over the internet or though other advertising means. So if you get rid of the sale of puppies in pet stores you’ve only eliminated a small part of their income. I work in a shelter and about 30% of the dogs we have available for adoption are purebred dogs. We do not get many seizures of dogs in this area. We do have irresponsible breeders surrendering puppies from litters they couldn’t sell, or adult dogs they can no longer breed. But I would say the majority of our purebreds are owner surrender because they didn’t know what they were getting themselves into (the 9 month old GSP surrendered because it had too much energy! ), or for other reasons. It’s important to remember that not all areas have the same animal sheltering issues — which can vary greatly from area to area. In the southeastern WI area we don’t have to euthanize dogs because we lack space since people are doing such a great job of spaying and neutering their pets. If you drive a few hours south shelters are dealing with an over-population problem that is overwhelming. I know people in animal rescue that are adamant that people should not breed dogs because they feel those people are just adding to the problem. However, where I work a number of our employees have purchased puppies from responsible breeders and they are not ostracized for it. As a humane educator I try to educate the teenagers I work with as to what a responsible breeder is and why it’s imporant to find a breeder who breeds for health and temperment, and understands the importance of socialization. I don’t tell them they should ONLY adopt from a shelter or rescue — because that’s not realistic. I think that the only real solution to the over-population problem is education on topics such as the importance of spaying and neutering pets, what to look for in a responsible breeder, what goes on in puppy mills and how to avoid purchasing a mill puppy, what to research and consider before you get the dog, and finally giving people information that will help them raise a well rounded puppy and help them deal with behavior problems. Until we do that it’s just like bailing out a leaky boat without bothering the plug the hole. @Laurel re: training class refunds and distance: HEAR, HEAR! Of my three current rescues, the closest was two and half hours from me and the breeder of my fourth dog was nearly five hours and two hundred and fifty miles. How realistic would it have been for me to use a pre-paid training class from a trainer that far away? Proper? I’m sorry, I didn’t realize they had a pet ownership grammar course in colleges and universities these days. What she meant was that it was proper when talking to her about it; she preferred those terms. This all falls under what I call the “command vs. cue” argument. Language is what you make of it, and it is always evolving; using a term that is out of favor because of negative connotations some people have is not an issue for me, I know what I mean when I say it. This woman obviously wasn’t comfortable with the impression she gets from “dog owner”; however, and not to be gross, my sperm had nothing to do with the creation of these dogs and I am not their parent. That is not to say that our relationship is something akin to what I have with the computer on which I’m typing this though; give me a break. What the average person knows of a conformation dog show is what they see on the AKC/Eukanuba World Championship or Westminster: judging for the groups and Best in Show. What they don’t is that there is a sort of temperament test in the breed ring for about half of the terriers. It’s a judging technique called sparring. Speaking of negative associations, I can imagine some of you thinking about two dogs face to face, up on their rear legs, “boxing” and growling at each other while the handlers with their knuckles white, hold on for dear life. Sparring is not a requirement and not all breeds of terrier are sparred; AmStaffs, Staffies, Bull, and Parson Russel Terriers, among others, are not. While it is not a requirement, most experienced terrier judges will ask that the dogs be sparred, so if there is a champion Airedale, Irish, Scottish, Welsh, etc Terrier, chances are it has sparred in the ring a time or two. Here are videos of the breed judging for Irish and Airedales from Westminster with sparring shown during about the last third of each video. Note that the Airedale who does get a little contrary is not one of the two being sparred. To Cassie: I wish you were my vet! The “Help breeders/rescues be realistic” section really hit a chord with me. On of my ex-foster dogs died last week at about 15 years. He spent his last 2 years with the most wonderful family I could hope for. Before adopting Willie to the woman I spoke to her several times and met with her but I did not do a home visit. Later when I went to visit I was thankful I had not done a home visit. She lived in a run down apartment complex. I knew she was not wealthy but I didn’t realize she was that poor. Yet, Willie never lacked for vet care. When he had problems she took him to the vet. When he had an emergency she took him to the ER. She invited me to visit and kept me informed on how he was doing. Willie was with people 24×7 and was loved by all who met him. I am so thankful that I didn’t have the opportunity to judge something that had nothing to do with being a wonderful family to a very special dog. I think there are many valid points in this post, one being the breed club and its importance. There needs to be a distinction, however, between a breed club and a registry. I am a member of a breed club, the VDD (the DD, or Deutsch Drahthaar, is also referred to in the US as the German Wirehaired Pointer – there is a difference between the 2, but the GWP was founded with the DDs in the 1950s when they were imported). The DD is a versatile hunting dog, able to hunt upland game, waterfowl, and blood-track large game. We are a North American group of the German parent club, abide by the rules set in Germany, and our dogs are actually registered in Germany. All dogs MUST be certified if their offspring are to be registered as breedable with the VDD, an FCI-approved group. The breed’s motto is “from performance to type”. Our dogs must complete 2 breed tests, a spring puppy test and a fall test to evaluate the hunting abilities of the dogs. There is a “graduate-level” test, so to speak, that is optional that is conducted over the span of 2 days. That is the performance/ability aspect of the dogs. They also need to be evaluated for coat and conformation. Each dog is allowed the opportunity to be evaluated twice in each test, and that is it. All dogs are judged to a standard, not against each other. I admit I am a drinker of the Kool-Aid, but I also see why after over 100 years, the breed has been successful and we are breeding better dogs. The system works. I am not against the AKC, and do not mean to be condescending, but the AKC is simply a registry. It does not do anything (as far as I know so correct me if I am wrong) to set standards for breeding. The only standards with which I am familiar are those established for the breed ring. I love the Weimaraner, but it is very difficult to find one in the US that has much hunting ability left. In my opinion, they have mostly been bred for the show ring and little regard has been placed on their hunting aptitude when breeding. Border Collie folks would be able to confirm this statement, but I believe when the Border Collie petitioned for acceptance to the AKC registry, those in favor of it were reluctant to create a conformation standard. In my opinion, the Border Collie folks new that what was most important was the dogs’ working aptitude and that conformation, while important, was not as important. I think it would be very helpful if breed clubs could establish (if they don’t do so already) some minimum requirements for breeding. I cringe when people tell me they’re breeding their purebred dog because they want their children to experience the miracle of life. With so many unwanted dogs already, I don’t think that a prudent reason to breed one’s dog. Khris, what a succinct and spot-on summary of the needs & challenges for reducing the number of dogs at shelters :). The educational materials already exist, but getting the information and assistance to the right audience is the biggest challenge, and one that breeders, rescues, and shelters all need to tackle, focusing most heavily on the knowledge gaps in their particular region (my region, sadly, needs it ALL). Correct me if I am wrong, but from what I understand the AKC does not allow individual breed clubs to set standards for genetic testing or performance in addition to their conformation standards. If the breed club chooses to implement them, they remain optional only and a dog with genes for say, a heritable seizure disorder can still earn an AKC championship. I think AKC has a responsibility to do a lot more, even if it is just to allow individual breed clubs more control over their standards. 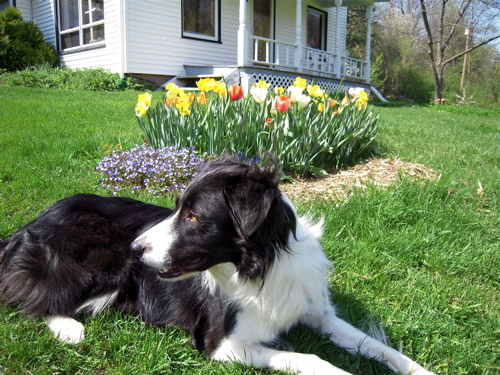 I know from reading about the Border Collie thing in the 90s that a substantial portion of those breeders would have preferred a standard that emphasized performance over a narrow definition of height, coat, and weight. It may be just a registry, but the AKC is the preeminent dog organization in the US. They have an opportunity to be a leader that no other organization does, and in my opinion they are squandering that opportunity. Judges have more influence on behavior than national breed clubs. I showed a Rottweiler once and the female in front of her rumbled softly. She wasn’t tense, it was just a very soft warning. She was instantly removed and written up. In another show, the winners dog Weimaraner was not removed despite his repeated growling and roaring at the other dogs and very tense threatening body. My dog had the misfortune to be right in front of him. I showed my dog standing behind his tail stretching my arms forward, so that he knew he had me to protect him. Breed clubs could emphasize behavior tests more, i.e. CGC, TDI, TT, etc. by giving points towards Register of Merit or Versatility awards. As far as breeders working with rescues, who do you think makes up many rescues? Why the breed fanciers of course…ie. the breeders! I’ve fostered nearly 200 dogs in my home in part because I believe its part of my committment to the breeds I’ve produced(only a few litters in many years). There is even a breeder on the board of the local humane society. I see more dogs in shelters because of a lack of development of the human animal bond, mostly because of behavior and training issues. For example, the hound I’m fostering now doesn’t know how to settle. I’m simply having him down stay for an hour every evening and he’s learning to be calm in a house. I feel like this may be a crucial behavior if he’s to be successfully place in a home. And I have to add my ideas on commercial breeders. I am appalled by what I see in pet stores selling puppies. Really, it makes me want to throw up, but I keep making myself go look just so I can say I’ve observed it firsthand. But, I’m opposed to commercial breeder legislation. This is America, land of the free, i.e. free commerce and so on. There would be no commercial breeders if no one was willing to buy puppies from pet stores. So, buyer beware! I think education efforts fall way short..including the ones I repeatedly chant. I think we are much more successful at preaching to the choir than to the public. On topic… I do also think that good public education is really the key. It’s not silver bullet but if you’ve worked with people long enough you know there is no one solution. It will be like a buffet; a little legislation (meat), to go with the education (veggies). And it has to be put out to the public in a way they can wrap their heads around. Big long speeches do not change modern America. It will be *years* of doing education in 2 minute bits. We’ll get there. Small Breeder Legislation is all stick and no carrot – how is that good psychology?? OTOH, I really would like to see USDA get out f the business of ‘inspecting’ puppymills. It gives pet stores a working list of ready suppliers and can immediately turn around to an unsuspecting public and say “Look! Our puppies come from breeders who are inspected by the government. They are of the highest quality.” Seriously. Frowny face just doesn’t cover it. That said, lets all remember that for some breeds AKC isn’t the only game in town and some of the smaller registries are very reputable and way ahead of AKC in using science & social pressure to effectively manage their breed and do out reach. AKC is just a registry, if it ever operated as a real breed club it’d be broke. So drill down and look at the operations of your breed clubs. Ask more of them for your membership dollars!! Most importantly though: there is hope. I’m a member of a breed specific posting board and we’ve had a huge uptick in new members who are trying to educate themselves before buying a dog. After years of rescue, it makes my heart sing. Thanks for the 10k time Trish for such a great blog. Its wonderful to have someone bridging the gap between the science of behavior and working dogs on livestock. Tricia – you can try using the DAP difuuser on an automatic timer, that way you only have to spend a few minutes setting it up and not have to worry about it for a month or more. Well I am a life long trainer of my dogs, have worked with the same trainer for 14 years we on 3rd generation dogs. And I can tell you that most people do not want to take the time or good advice on training their dogs. I have seen far to many “Nice” dogs that where out of control and their owners where responsible for it. People ask advice but when you start talking about training you get the deer in the headlights look. They don’t want to do the work to have better dogs in most cases. You can have an contract as a breeder that tells people you dog will need puppy classes for socializing, you should take your dog through at least basic obedience. I know some that offer to Pay for it, and you guessed it they do not follow through in most cases. I think blaming the breeder for people turning their dogs into shelter are ridiculous. I do agree that big commercial breeders and puppy mills need to be regulated but one things I believe would help the most is banning Pet Stores for selling Puppies. It is not the bread of butter of any store and if you think about it really Pet stores would do better working with Shelters then Puppy Mills. I realize that this is an older post, but it was this very post that made me realize that I could bring together my profession as a lawyer with my passion for animals, and dogs in particular. I have been working diligently on a Companion Animal Law blog ever since, and have finally gone live this weekend with the site. Please feel free to visit the blog at http://www.petlawblog.wordpress.com. Don’t miss the “About Heidi” page, where I have given you credit for helping to lead me down this exciting path! Thanks for all of your inspiration!